Reap: Use an opponent’s artifact as if it were yours. When reaping with Nexus, can I choose to not use an opponent’s artifact? No. You always resolve as much of a card’s abilities as possible. If you reap, you must use an opponent’s artifact – if possible – even if it’s not beneficial to you. Does my opponent’s artifact become ready at the end of my turn? No. At the end of your turn, you only ready cards you control. 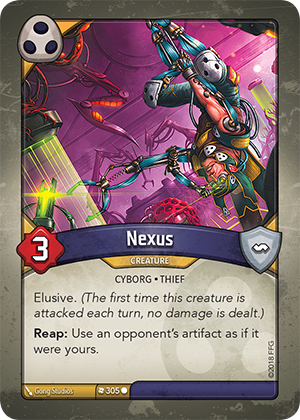 Therefore, the artifact used with Nexus will stay exhausted for your opponent’s next turn and they will not be able to use it. The artifact will ready itself – as normal – at the end of your opponent’s turn.